This shop has been compensated by Collective Bias, Inc. and its advertiser. All opinions are mine alone. #MagicBabyMoments #CollectiveBias Last year on Christmas Day, my brother and his wife told me some very exciting news… they were expecting a baby boy! Finding out I was going to be a first-time aunt was thrilling. Plus I was excited for my son to finally have a cousin in the family. Now if you are a regular reader of this blog, you know my family and I LOVE Disney. So I was quite determined to give my new nephew a bit of that Disney magic in his nursery! Luckily I discovered the amazing Disney Baby line, available at Walmart. This is a sponsored post for Luvs via SheSpeaks. Though I was financially compensated, all opinions are 100% my own. Ah the joys of potty-training! Yes, we are in that stage where I’m teaching my 2 year old to use the potty. Unfortunately it isn’t moving as fast as I wished. So yes, I’m still buying him diapers, especially for when we head off for long outings. It’s just more convenient to use a diapers when out. Also diapers are more ideal for overnight when I know he is fast asleep and potty training isn’t even a blip on his radar! I can’t tell you how excited I was to try the new Luvs Super Absorbent Leakguards with my son. These diapers are actually 15% more absorbent than regular Luvs diapers out there in the market. The ultra thin Leakguards feature an adorable monkey, which is great because luckily my son loves monkeys! As a blogger I’m always excited to see my fellow bloggers hit their goals and milestones. Recently Viva Veltoro and Thrifty Nifty Mommy have hit some pretty awesome blogging milestones! To celebrate Viva Veltoro reaching 10,000 Facebook followers and Thrifty Nifty Mommy reaching 25,000 Facebook followers, they’re hosting a huge giveaway event! Today’s amazing giveaway is coming to you courtesy of Graco! 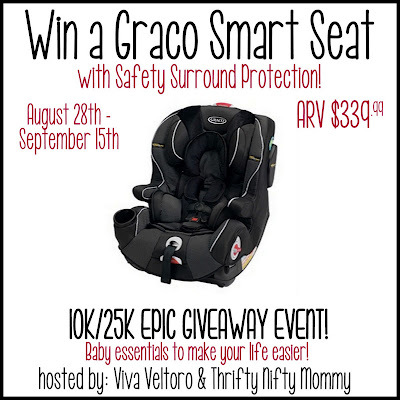 Viva Veltoro had the opportunity to review the Graco Smart Seat with Safety Surround Protection, valued at $339.99. Check out her review of this fantastic all-in-one car seat HERE. The Graco® Smart Seat™ All-in-One car seat is the ultimate in car seat longevity and has the only side impact protection properly positioned to protect your child at each stage. This convertible car seat fits your child from 4-100 lbs, features Safety Surround™ Side Impact Technology, and Smart Base™ a convenient stay-in-car base so you only have to install the base one time! Additional features you’ll love include, seat-to-base locking indicators, 5-position recline, flip up arm rests, integrated cup holder and a 6-position adjustable headrest with no re-thread harness. I received complimentary product(s) to facilitate this review from the sponsoring company. This is 100% my own honest opinion and I did not receive financial compensation. This review is solely based on my own experience with this product. Now I’ve always been a huge sports fan during my lifetime. When I gave birth back in April 2011, let’s just say a large time of my maternity leave was spent watching baseball games (on television of course!) with my newborn baby boy in my arms. When I first heard about the Baby Bat collection from Texas Timber Bay Company, I have to say that these personalized heirloom bats would have been the PERFECT baby gift to give a sports fan like me. So what makes Baby Bats such a unique and special gift? Each bat is actually custom made to the length of your baby when he or she was born! How awesome is that? The bat is then inscribed with your baby’s name and other birth statistics such as date, time, weight, and height. Just keep in mind that the character limit for the baby’s name is 25. Of course if your child has long names, you can use initials instead. Bats can be customized with a blue or pink ribbon as well. Two years ago on April 2nd at 7:10 pm, I gave birth to my beautiful baby boy. I’ll spare you the details, but I’ll just saw it was quite an experience! In an instant, the love of my life was this not so little bundle of joy. Crazy to think about how much he has grown up these past two years. Time sure flies, doesn’t it?